KFC Set to Revive the 120 Year Old Colonel! 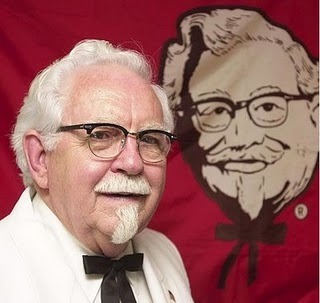 Our cultural connection to Colonel Sanders seems to have been lost in the deep-fryer of time.Colonel Harland Sanders, the goateed founder of KFC known for his white suits, string ties and “finger-lickin’ good” punch line, would have turned 120 years old today. But young adults don’t know him from beans. More than six in 10 Americans ages 18 to 25 — the chain’s key demographic — couldn’t identify him in the KFC logo, according to a survey last week by the chain. Worse, five in 10 believe he’s a made-up icon and three in 10 haven’t a clue who he was. That’s why KFC is taking action. Today, the world’s largest chicken chain, with 15,000 outlets in 109 countries, unleashes an online PR blitz aimed at bringing the Facebook generation eye-to-eye with the venerable colonel. KFC will be using its Facebook presence, Twitter, MySpace, the KFC website and other digital outreach to introduce them to Sanders and prod them to create and upload a piece of art that could become a painting to hang (temporarily) next to the famous Norman rockwell painting of Sanders at the company’s headquarters in Louisville. The image confusion is in part KFC’s own doing. In the past few decades, it ping-ponged back-and-forth from fried-chicken-maker to grilled chicken specialist. 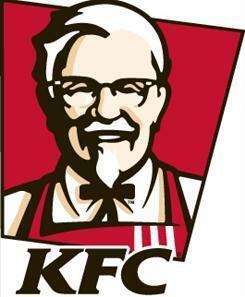 In the logo, it put the colonel in a red apron instead of his iconic white suit. And it turned its Kentucky Fried Chicken name into KFC. On a vaguely similar but much larger scale, Domino’s late last year tossed out its pizza formula and mocked itself in ads that conceded the old pizza tasted like cardboard. Sales zoomed. For KFC, it’s been a rough year domestically. KFC’s same-store sales fell 7% in the U.S. in the second quarter, facing a difficult comparison with the same quarter in 2009 when a new grilled chicken product was launched. KFC has basically stopped growing in the U.S., and almost all growth is pegged to come internationally in 2010. Now, KFC’s trying to paint a new picture — actually asking its core consumers to paint it for them. Through Sept. 30, artists can upload their sketches of the colonel at kfc.com/portrait. The winning artist will receive $1,100 ($100 for each of the 11 herbs and spices used for the Colonel’s Original Recipe chicken) and get to paint a new portrait of the colonel. One last twist: The artist will be using paint into which KFC has blended the secret 11 ingredients. Japanese clothes retailer Uniqlo has found a novel way of encouraging U.K. shoppers give the brand a big presence on Twitter — by reducing the price of clothing pieces every time someone sends a tweet about an item. 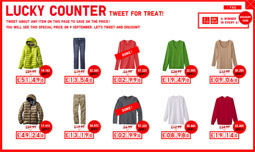 The “Lucky Counter” promotion has been running ahead of the relaunch of Uniqlo’s U.K. e-commerce site this week, and has seen the brand’s name appear in Twitter’s trending topics list for the country. In a web page dedicated to “Lucky Counter,” users can choose from 10 pieces they would like to see discounted on the website when it relaunches on September 9. Clicking on one of the pieces of clothing brings up a pre-written tweet using the hashtag #luckycounter. Users can add their own message and then send it, and watch the price fall. The more tweets users send about a particular item, the lower the price goes. At the time of writing, one of the items — a gray, crew-neck long-sleeve T-shirt — had hit its target price of nearly 60% off, meaning it will go on sale on Thursday at $4.60 instead of $10.70. Uniqlo worked with Hiroki Nakamura, web director of its global advertising agency, Dentsu Japan, to create the campaign. The U.K. is the first market that Uniqlo, which also has stores in the US, France and throughout Asia, has tried the approach. 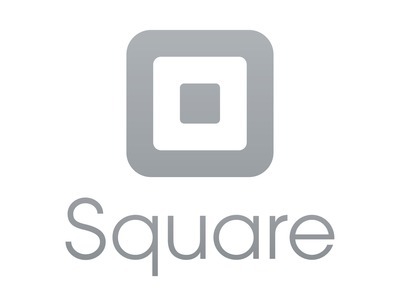 The company has relied solely on users to spread the word on Facebook and Twitter, rather than paying for promotional tweets, as well as trailing the promotion heavily on its website, which was otherwise closed for business. The tweets being sent are largely a mixture of people taking part in the promotion and those who are telling their followers about Uniqlo’s unusual social-media experiment. 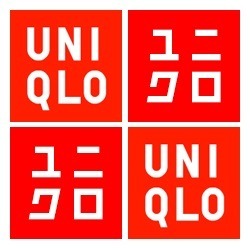 Amy Howarth, head of marketing at Uniqlo in the U.K., said: “The initial aim was to maintain contact with the customer while the website was temporarily closed for its e-commerce migration. After the new site goes live, Uniqlo will promote it with an online pinball game called “Lucky Machine,” offering a cash prize and discount codes. Uniqlo has frequently used Twitter in its marketing campaigns. This year’s efforts have included U-tweet, which delivered users a personalized video based on tweets that they had sent to promote the UT T-shirt line; and Sportweet, which also drew on users’ tweets combined with footage of athletes to promote Uniqlo’s sportswear. Why did they do this? To evaluate the power of social media and spreadable content. As an experiment, Jerzify Yourself was highly successful in adding the much needed texture to the knowledge of how content gets passed along online. One obvious caveat here is that the observations below are based on a single experiment, so please treat them as such and not as some kind of immutable laws. If you find yourself measuring the value of referral sources for your campaign, consider their total impact via re-shares in addition to the direct traffic they send your way. Counting only the direct clicks from any site is likely to underestimate the site’s total value; five out of six sites on our top referrers list sent almost as much traffic through re-shares as through direct clicks. It would make for an interesting follow-up experiment to see if this difference holds up for paid campaigns as well as for “organic” content. If it does, and this difference is measured, it would have important implications on how we plan media buys. 2. If It Doesn’t Spread, It’s Half-dead. Dr. Henry Jenkins once made this now-famous remark about the destiny of content in the age of social media: “if it doesn’t spread, it’s dead.” Having looked at the data, we can now say with a degree of confidence that you’ll still get viewers if your link gets picked up by major online publications, but content that’s designed to be spreadable can nearly double the referred traffic through re-shares. 3. Some Sites Are Read By More Active Spreaders Than Others. Some sites on the top ten list turned out to be a lot more spreadful (for lack of a better word) than others. Buzzfeed, in particular, sent more traffic — twice as much! 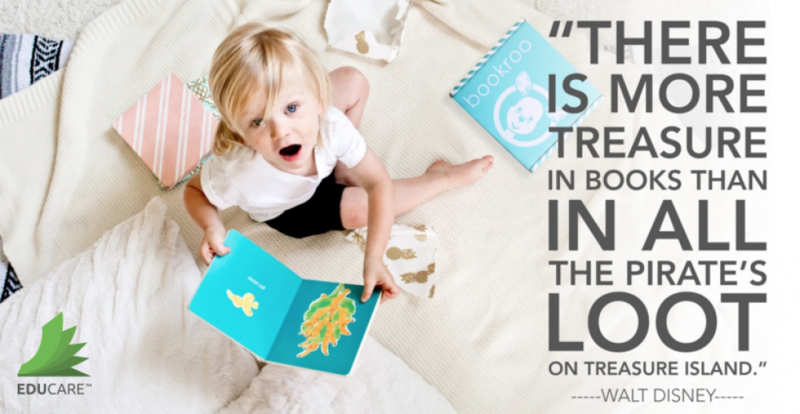 — via re-shares than through direct clicks. In fact, the number one direct referrer, collegehumor.com, will come last if we re-rank the sites by “boost.” These observations along with our understanding of the reasons behind the differences will influence the way we design online properties meant to encourage content sharing. It would also be interesting to see if there is a difference in the length of pass-along chains between different sites. On average, the link traveled down two or three generations of users before the chain broke, and chains as long as seven users could be seen. 4. The Speed of Content Depends on the Medium Through Which It Travels. You know how the speed of sound depends on the medium through which it passes? It’s like that with Twitter and Facebook, and probably other social networks. To repeat an observation made earlier: in our experiment, shared links had a much longer gestation period but also a longer shelf life on Facebook than on Twitter. 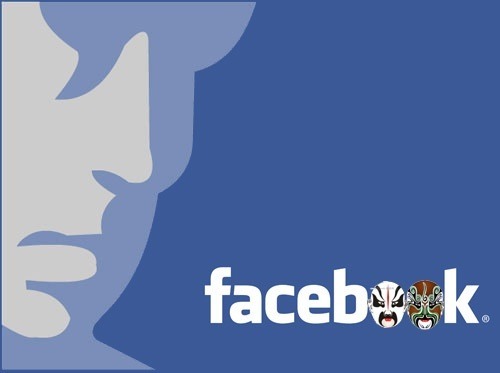 For the entire January-May period, Facebook has referred 12,789 visitors, 83% of them after the first week. Twitter has referred 10,549 visitors altogether, 97% of them during the first week. This difference probably has to do with how people access the news feeds on these sites. On Twitter, the single stream of news quickly washes away older items. On Facebook, older news can still be the front-page material on the individual slower-moving walls. If you find yourself choosing between the two sites for your next campaign, be aware of this difference. 5. Don’t Reach For the Off Switch. As the 404 errors on formerly popular viral branded destinations demonstrate, it might be tempting to kill the destination site some time after the traffic has peaked. Experts argue that abandoning old micro-sites in their Long Tail phase means leaving money on the table, and the experiment has demonstrated that not only do off-peak sites attract healthy traffic, these visitors can also be more valuable than the rush-hour crowd. In toying with ads, Twitter, the net’s largest micro-publishing service, is going where every internet company in search of a dollar has gone before. But the history of how advertising has been introduced into a formerly commercial-free community is mixed, and success for this billion-dollar baby depends on how they decide to zag. Twitter, the net’s largest micro-publishing service,launched an ad service that will let advertisers — beginning with some of the world’s top brands such as Starbucks — have their tweets show up in the top of search results. It’s a first attempt by the service to make money from its users. Twitter’s ad model should sound familiar to net users, because it’s not unlike Google’s search ads — which let advertisers have links to their services and products show up above and beside search results. It’s not a bad model to work off, given those tiny ads propelled Google into one of the world’s top tech companies with enough global clout to even take on Microsoft and the Chinese government. Twitter is moving tentatively, however: Only one “sponsored tweet” will be displayed alongside search results, and the ad has to be something the advertiser already tweeted. 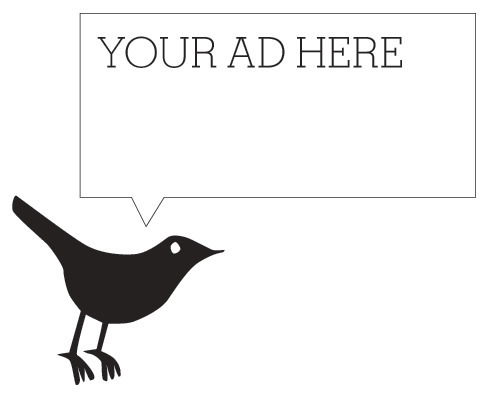 Will the ad model help verify Twitter’s billion dollar valuation? I wonder. In the aftermath of the earthquake many Americans are reaching for their cellphones to make a donation via text message. And plenty of them are then spreading the word to others on sites like Twitter. The American Red Cross which is working with a mobile donations firm called mGive, said Thursday that it had raised more than $5 million this way. The mobile donations are part of a larger surge of money flowing to the relief effort. The Red Cross said it had collected nearly $35 million as of Thursday night, surpassing the amounts it received in the same time period after Hurricane Katrina and the Indian Ocean tsunami. The Red Cross expects that donations made through more established channels — writing a check or on the Web — will still far outweigh text-message giving. But the cellphone campaign may be reaching people who might not otherwise have made the effort to get involved. 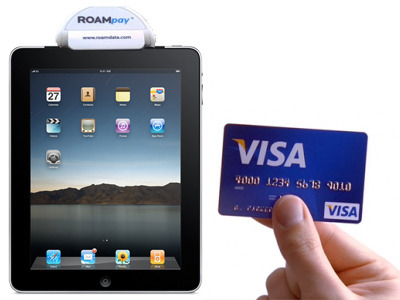 Convenience is one factor in the campaign’s success. People simply send a designated word to a five- or six-digit number and then confirm that they want to give, and the donation is charged to their wireless bill. At the end of the month, the carriers transfer the contributions to a service provider like mGive, which passes them on to the charity.